Like everyone else, elite investors make mistakes. Some of their top consensus picks, such as Amazon, Facebook and Alibaba, have not done well in October due to various reasons. Nevertheless, the data show elite investors’ consensus picks have done well on average over the long-term. The top 30 S&P 500 stocks among hedge funds at the end of September 2018 returned an average of 6.7% through November 15th whereas the S&P 500 Index ETF gained only 2.6% during the same period. Because their consensus picks have done well, we pay attention to what elite funds think before doing extensive research on a stock. In this article, we take a closer look at FMC Corp (NYSE:FMC) from the perspective of those elite funds. There wasn’t much net activity in FMC Corp (NYSE:FMC) shares during Q3 among the hedge funds tracked by Insider Monkey. In fact, there was none, as the number of hedge fund shareholders remained the same at 37. There was a modest 4% increase in the value of their holdings during the quarter, to $1.89 billion, despite the stock dipping slightly in value. Jay Petschek and Steven Major’s Corsair Capital Management was one of the fund’s buying shares in Q3, hiking its FMC stake by 19% to just over 250,000 shares. Corsair believed FMC’s fair value was $120 per share as of the fund’s Q2 investor letter, which represents nearly 50% upside. “FMC Corp. (“FMC”) recouped most of its first quarter 2018 decline, rising 17% during the second quarter. The company reported another “beat-and-raise,” confirming our thesis that the acquisition of crop protection assets from DowDuPont (“DWDP”) would drive significant earnings accretion and that Lithium revenue and EBITDA would continue to ramp. Management’s 2018 earnings guidance range is now $5.90-$6.20 per share, and we expect 2019 earnings to exceed $7.00 per share. We also believe that as FMC’s net leverage drops closer to 2.0x EBITDA in 1H 2019, there is a high likelihood that the company’s Board will authorize a material share repurchase program. A buyback program, significant earnings growth and the upcoming spinoff of the Lithium segment in early 2019 should drive the stock closer to our view of fair value of $120 per share. FMC shares finished the second quarter at $89.22,” the fund wrote. According to most stock holders, hedge funds are viewed as worthless, outdated investment tools of years past. While there are over 8,000 funds in operation at present, our experts choose to focus on the leaders of this group, around 700 funds. These investment experts handle most of the smart money’s total asset base, and by paying attention to their finest picks, Insider Monkey has deciphered various investment strategies that have historically outperformed the S&P 500 index. Insider Monkey’s flagship hedge fund strategy outstripped the S&P 500 index by 6 percentage points a year since its inception in May 2014 through early November 2018. We were able to generate large returns even by identifying short candidates. Our portfolio of short stocks lost 26.1% since February 2017 even though the market was up nearly 19% during the same period. We just shared a list of 11 short targets in our latest quarterly update. 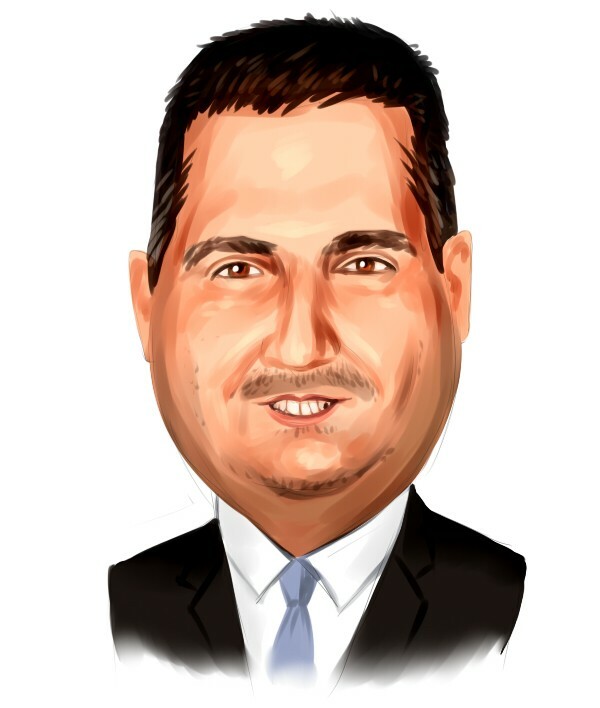 How are hedge funds trading FMC Corp (NYSE:FMC)? At Q3’s end, a total of 37 of the hedge funds tracked by Insider Monkey held long positions in this stock, unchanged from the previous quarter. 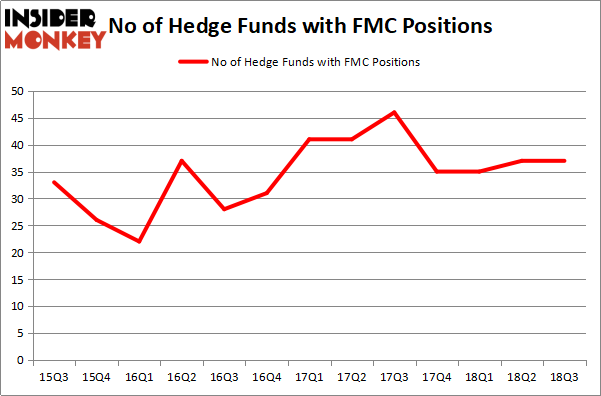 Below, you can check out the change in hedge fund sentiment towards FMC over the last 13 quarters. So, let’s examine which hedge funds were among the top holders of the stock and which hedge funds were making big moves. More specifically, Glenview Capital was the largest shareholder of FMC Corp (NYSE:FMC), with a stake worth $743.4 million reported as of the end of September. Trailing Glenview Capital was Suvretta Capital Management, which amassed a stake valued at $263.3 million. Thunderbird Partners, York Capital Management, and Citadel Investment Group were also very fond of the stock, giving the stock large weights in their portfolios. Seeing as FMC Corp (NYSE:FMC) has faced declining sentiment from the aggregate hedge fund industry, it’s safe to say that there was a specific group of money managers that decided to sell off their positions entirely in the third quarter. Interestingly, Christopher A. Winham’s Tide Point Capital cut the largest stake of the “upper crust” of funds tracked by Insider Monkey, valued at about $28 million in stock. Jim Simons’ fund, Renaissance Technologies, also cut its stock, about $22.9 million worth. These moves are important to note, as total hedge fund interest stayed the same (this is a bearish signal in our experience). Let’s go over hedge fund activity in other stocks – not necessarily in the same industry as FMC Corp (NYSE:FMC) but similarly valued. These stocks are Viacom, Inc. (NASDAQ:VIAB), EQT Corporation (NYSE:EQT), The J.M. Smucker Company (NYSE:SJM), and New Oriental Education & Technology Group Inc. (NYSE:EDU). This group of stocks’ market valuations are similar to FMC’s market valuation. As you can see these stocks had an average of 32 hedge funds with bullish positions and the average amount invested in these stocks was $1.14 billion. That figure was $1.88 billion in FMC’s case. EQT Corporation (NYSE:EQT) is the most popular stock in this table. On the other hand New Oriental Education & Technology Group Inc. (NYSE:EDU) is the least popular one with only 25 bullish hedge fund positions. FMC Corp (NYSE:FMC) is not the most popular stock in this group but hedge fund interest is still above average. This is a slightly positive signal but we’d rather spend our time researching stocks that hedge funds are piling on, like EQT.